EB Games Canada Flyer Apr 6 – 12, 2018 - Xbox One X 1TB Console + Destiny 2 $599.99 Sale Price. 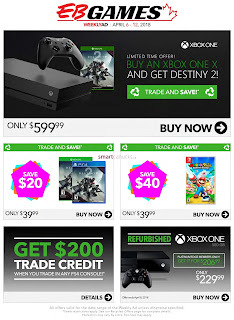 Destiny 2 Model #: 730584 $39.99 Sale Price $20.00 Savings From the makers of the acclaimed hit game Destiny, comes the much-anticipated sequel. An action shooter that takes you on an epic journey across the solar system. EB Games Canada Flyer Mario + Rabbids Kingdom Battle Model #: 732234 $39.99 Sale Price $40.00 Savings The Mushroom Kingdom has been torn apart by a mysterious vortex, transporting the chaotic Rabbids into this once-peaceful land. To restore order, Mario, Luigi, Princess Peach, and Yoshi must team up with a whole new crew made up of four Rabbids heroes! Together, they will battle with weapons through four worlds filled with combat, puzzles, and unpredictable enemies. Penny Punching Princess Model #: 734063 Use the money you gather to bribe enemies to fight for you, activate deadly traps with your dough, and when all else fails, smash all that stand against you with your fists! Fight your way from nothing and amass treasures to take on the mighty Dragoloan Family and reclaim your kingdom!. 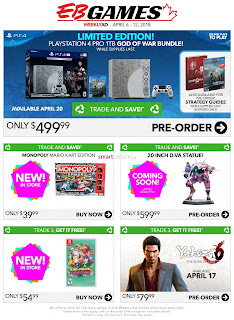 Yakuza 6: The Song of Life - Essence of Art Edition with Bonus Model #: 733599 $79.99 Sale Price The final chapter of Kazuma Kiryu, the long running protagonist of the Yakuza series, is coming to a close in Yakuza 6: The Song of Life. The Essence of Art Edition commemorates the legendary Dragon of Dojima by featuring a sleek, 24-page hardcover art book, which doubles as a disc holder, featuring art contributed by fans. Overwatch: D.Va 20" Statue $599.99 Sale Price South Korea is under threat by a colossal omnic monstrosity. Scrambling to find suitable candidates for its armored MEKA unit, the government turned to the nation's professional gamers. Enter reigning world champion Hana Song, a.k.a., "D.Va," a fierce competitor who plays to win at all costs and has a well-earned reputation for showing no mercy to her opponents. Seeing her new mission as a game, the global icon is ready to spring to her homeland's defense at a moment's notice.